Bengal Cats are able to impress us at the first sight by their beauty and predation eye. Although, their country of origin is USA, but the Tiger cats have something enigmatic and graceful just as their Asian ancestors. Colors: Silver, Brown, Snow (Sepia / Lynx / Mink), Melanistic and Blue. Size: Average - a female commonly weighs 5 to 8 lb (3 to 4kg. ), and a male may weigh about 12-18 lb (7-,kg). Bengal cats as a separate species, was cleverly breeding from hybrids of the Egyptian Mau, Asian Leopard cat (the reason of Bengal’s exotic coloring), Abyssinian, Siamese and domestic cats. The breed was developing by different breeders for almost a hundred years! As a result, we’ve got kind of a small and domestic tiger. The main features of the Far Eastern cats are their hyperactivity, curious and communicability. Likewise, we love the Tiger cats for their eternal devotion. Further, these cats will follow all of your steps throughout the all your apartment to not leave you alone. So, basically, they are really active cats, which just can’t live without your lovely attention. Also, it is worth to note their impossibility and amazing leopard coloring, that give them insolence and "wild" grace. Therefore, if you want to get at home this ‘’tiger’’, you can’t do without a couple of toys and endless attention to make them happy. There is a long-hair type of this species, but only purebred Bengal are able to carry and share such genes. However, the long-hair Bengal cats was recognized as a separate breed only in New Zeland by the name of "Cashmere". The tiger cats carry a hypo allergic ability. It means that, most allergic people do not have any allergic reaction at Bengals, at all. That’s possible because of a few reasons, as a lack of shedding, only one layer of hair and their ability to produce the different consist of proteins. Thus, you can have a cat who will not spread any hair-balls all around your house and does not cause you allergies anymore. All in all, we’ve got an ideal domestic cat! Amazing! But, if you still have any allergic issues, the best way to check this out is to visit our breeder home, personally. 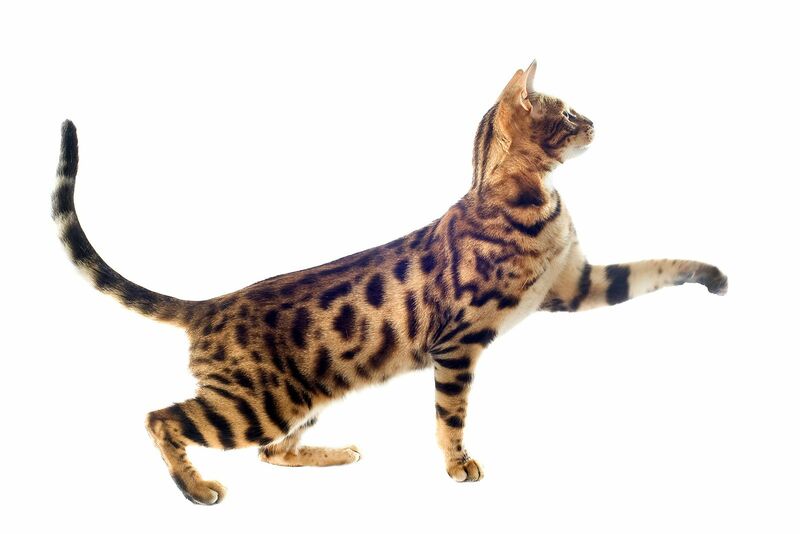 Bengal cats can make a jump over 4 feet from the ground! In addition to their hypo allergic ability, some Bengals’ kitten possess another unexplained phenomena such as frosted hair as well. Briefly, scientists still can not explain, how from two brown Bengals we are able to get a kitten with long white hair. However, this miracle disappears by itself as time goes, that is, as the kitten grown up. The frosted hair is a really rare feature, and this trait observed among purebred Bengals only. So, in order to keep contacted and be the first lucky one who will carry about this wonder, just check our site and Facebook page more often!